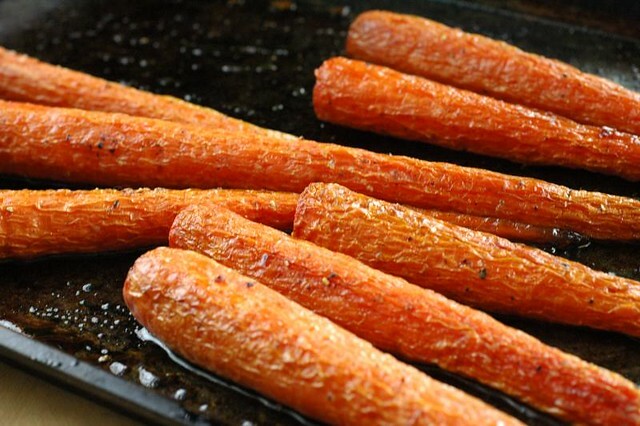 Carrots are such an underrated vegetable in the world of side dishes. And while it’s a shame I kind of understand. How many of us get carrots like these at our regular grocery store? Store bought carrots most of the time are bagged, with no greens and to be frank little to no flavor to speak of. 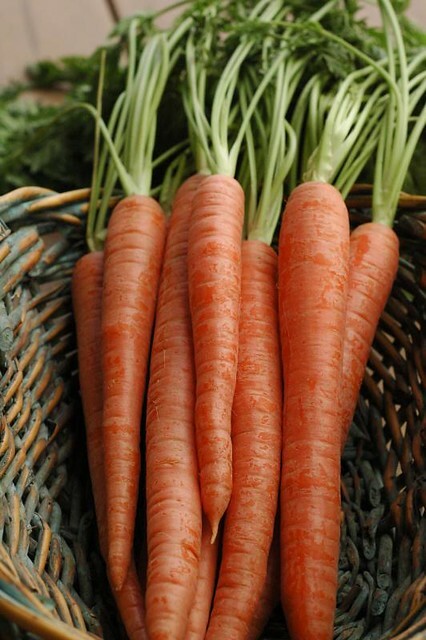 I know we may not always be able to afford 100% organic everything but if I may suggest that you purchase organic whole carrots the next time you shop I believe you will find like we have that they truly worth their cost. Better yet try growing your own! I remember the first time I tasted a homegrown carrot at one of my childhood friends house, I was shocked at how sweet and fresh it tasted! We are so conditioned to the woody bland carrots of the industrial production. 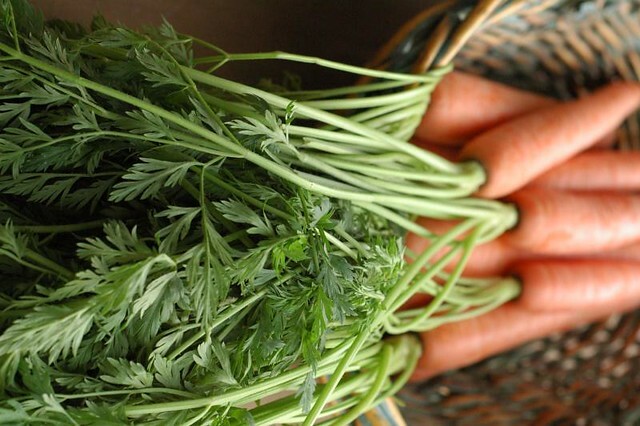 I have yet to have fabulous success with carrots as they need 8-12 inches of deep loamy soil to grow nice roots which I have never managed pull off. But once we get into our new place I am determined to win at this carrot growing business! The other important thing about carrots is to thin them or space them very well which I have miserably failed at. I plan to try my hand at this DIY Seed Tape the next time I try it as I have heard great success stories from the seed tape method. They are slow to germinate and do not like getting dried out. I have a not so fond memory of hand watering my carrot seedlings a hot spring 4 times A DAY and still not getting them to grow well. Ugh. Germinating carrots under burlap is my new tactic to try this next season. Roasting them turns this humble little vegetable into the star of the show. I was so proud of the Korean Short Ribs that I made last week which I served with this simple no brain cells pan of honey roasted carrots. I dressed them in simple olive oil and salt and pepper and roasted them for an hour at 325. When they looked about 10 minutes from being done I drizzled honey over them and gave them a quick toss. What resulted was so sweet and full of flavor that it shocked all of us. Kevin declared it the best carrot he had ever eaten, which I think is pretty darn awesome! Easy epic carrots for the win! 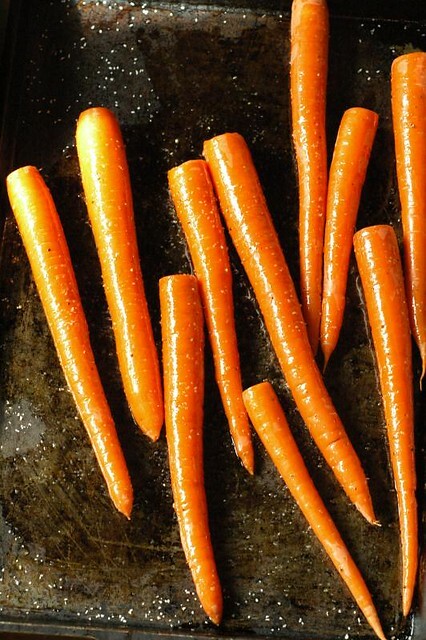 Fresh sweet carrots are roasted with a bit of honey for an impressive and simple side dish. Perfect for weeknights or entertaining alike! Coat with olive oil, liberally season with fresh black pepper and sea salt. Roast at 325 for 45 min-one hour or until skin starts wrinkling and is firm but able to be pierced with a fork (about 10 minutes before finished). 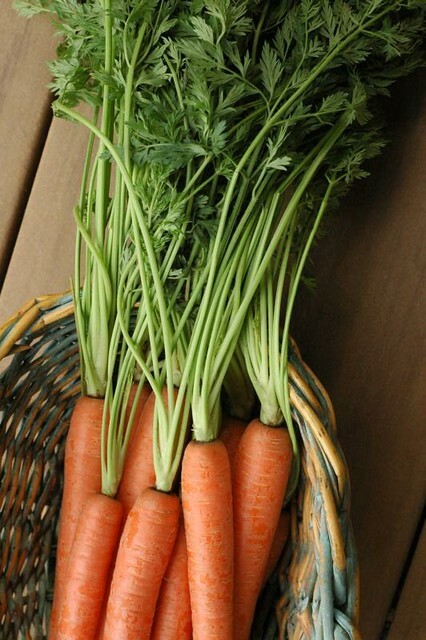 The size of your carrots greatly affects this....thin carrots need less time. 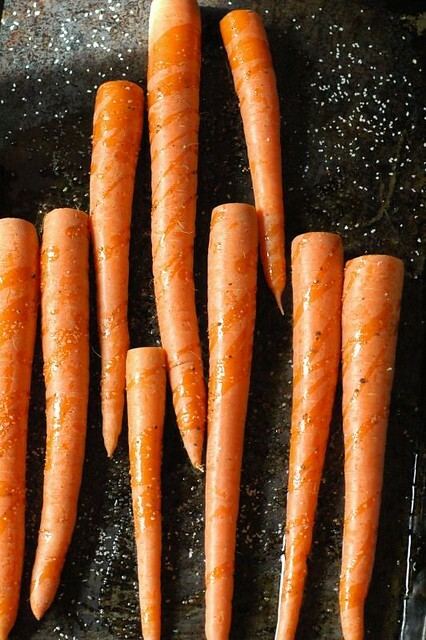 Drizzle honey over carrots and rock pan to roll carrots around to spread honey somewhat evenly. Roast until fork tender watching carefully that they do not burn in the last stage (about 10 min). 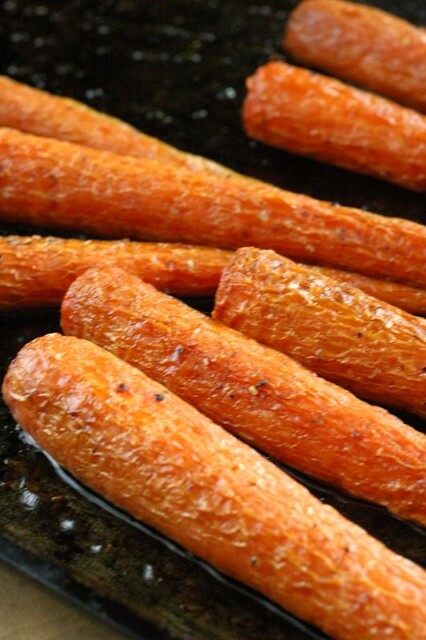 If you have widely different diameters of carrots you can add the small ones later in the roasting or remove them to a hot holding location as they complete roasting for equal doneness. 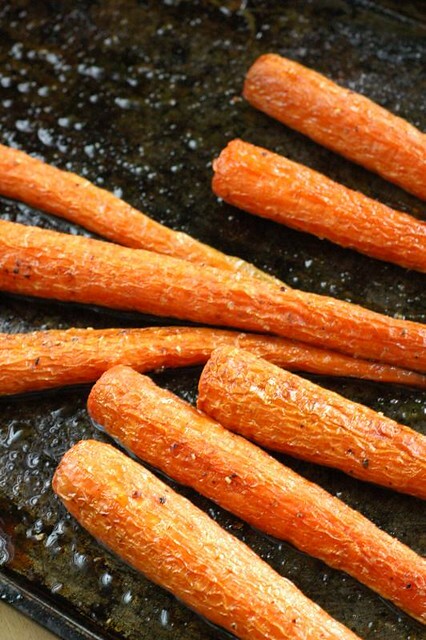 These carrots are amazingly delicious! And so simple!! Big hit at our dinner table!!! I am super psyched to be snacking on carrots and peanut butter as I read this recipe – it dulls the urge I have to climb through my screen and grab me some of those gorgeously roasted ones! Unfortunately I am a consumer of those dull store bought ones, but this year I am gonna try growing my own! Good luck with the DIY seed tape if you try it! Isn’t it terrible that we keep buying the boring lifeless carrots? I’m so guilty of this! Wow, this recipe sounds so delicious 🙂 Now I’m craving fresh carrots from the garden. Can’t wait to hear more about you trying the burlap technique this year!